In November I was notified of the passing of a pioneer of the Suzuki movement in Latin America, Dolores Olivia Soaje Bermann. I had met Mrs. Bermann personally at the International Suzuki Conference in Edmonton, Canada in 1985. Mrs. Bermann founded one of the first Suzuki programs in Latin America in Cordoba, Argentina in 1967. Today, many of the active and enthusiastic Suzuki teachers in Cordoba who are changing the lives of numerous students and their families were brought up as Suzuki students themselves. Thanks to Mrs. Bermann’s vision and dedication, Cordoba then inspired other regions of Argentina to research the Suzuki approach. Mrs. Bermann planted the seed and Argentina continues to enjoy the harvest. Just this month the first Argentinean Suzuki Method Journal has been published, edited by Suzuki piano teacher Carolina Poma. My thanks to Fernando Pinero (an ex Suzuki student himself and now a teacher), and to Nelly Murugarren from the Escuela de Musica Shinichi Suzuki in Córdoba, who sent me the tribute that follows. During the past few months I have had the opportunity to give courses in Antofagasta, Chile, Arequipa, Peru, and Sao Paulo, Brazil. It was the first time I had given a course in each of these cities. Antofagasta is in the middle of the desert in the North of Chile. I had first met the course’s organizer, Rafael Ramos during the Suzuki Festival in Santiago, Chile in 1991. To make his project possible, Rafael received financial support from FONDART, a Chilean governmental fund. Arequipa is a city made of white stone, situated close to the beautiful Misti volcano in the South of Peru. I was invited to Arequipa by piano teachers Elvira Villagra and Angelica Roldan whom I had met during the Suzuki Festival in Lima. I was pleasantly surprised to find that I had 70 music students and teachers in the Suzuki Philosophy course! Sao Paulo is a large and vibrant city. Clises Mulatti, director of the Tom sobre Tom Music School, co-directed the first Suzuki piano course in Sao Paulo with Maria Ignes Teixeira, of Curitiba. I became acquainted with Clises in 1999 at Holy Names College in Oakland, California during the Teacher Training Institute. In Sao Paulo 53 teachers from 13 cities in Brazil came together to study the Suzuki Philosophy. Many thanks to Rafael, Elvira and Clises for taking the time out of their busy schedules to write the reports which follow. In Sao Paulo, I taught a course on the Suzuki Philosophy. I was very moved to read the work of one of the participants, Valter Luiz, who wrote about his experiences with his son, Pedro Henrique who has Down’s syndrome, and his personal reflections on the Suzuki Philosophy. Valter Luiz kindly gave me permission to publish his paper. Many thanks to Barbara Barber for her update on violin courses in Brazil. What an excellent idea it is to start a database of Brazilian Suzuki teachers. Communication and networking are important themes for our upcoming Second Latin American Suzuki Teachers’ Conference which will be held in Curitiba, Brazil in January 2002. Everyone interested in supporting the Suzuki Movement in Latin America is invited to attend! Professor Dolores Olivia Soaje Bermann, “Loló,” to whom we bid our last farewell this past November 13th, introduced the Suzuki Method to Argentina. She had heard news of Dr. Suzuki’s work in the 1960’s and traveled to Japan to study this new philosophy and methodology. In 1967 she began to apply the Suzuki Method in Cordoba as a pilot study at the University of Cordoba. In the beginning she encountered innumerable difficulties, but continued with conviction in spite of the criticism of those who were suspicious of such a revolutionary idea. The Music School of Cultural Corporation in Antofagasta, Chile hosted a “Workshop for the Diffusion of the Suzuki Method from the 13th through the 16th of September. Caroline Fraser, SAA teacher trainer was invited to lead the workshop. Rafael Ramos, member of the Suzuki Association of Chile and founder of the Suzuki Piano Program in Antofagasta in 1992 assumed the task of organizing and doing fund raising for the workshop. To finance this event, Rafael presented a project to promote the arts to the Chilean Governmental Fund for Development of Culture and Arts (Fondart). This foundation selects annually from hundreds of proposals both at regional and national levels, those artistic and cultural initiatives that will have the greatest impact on a large number of people. In the Antofagasta Region, a total of217 projects were presented, 19 were approved, including the Workshop for the Diffusion of the Suzuki Method. This is a good example of how to take advantage of governmental agencies to fund this type of project. In the case of this workshop, it was considered by Fondart a well presented project with clear and precise objectives (a requirement of this agency) and therefore it was approved. The main objective for this event was the diffusion of the basic precepts of the pedagogical philosophy of Suzuki which would then generate reflection and debate about the different philosophies governing children’s musical education (not only in instrumental instruction, but also in classroom teaching). Towards this end, a conference was organized that united music educators, classroom teachers, teachers of early childhood and interested educators from various schools in the city. During three consecutive days, Caroline Fraser gave Master Classes and Group Classes to piano students in the Music School and offered a series of lectures. On the first day of the workshop, 87 educators attended the lecture. A complete success! On the second day, the lecture’s focus was more for instrumental teachers from the School of Music and other institutions. On the third day, the lecture was for Suzuki parents. On the fourth and last day of the workshop, a recital by Suzuki students and teachers was held in the Municipal Theater (home of the Music School) and open to the general public. More than 100 students participated: Mr. Ramos’ piano students, and violin, cello and flute students from other schools and institutions. I would like to point out that Caroline has been in Chile on numerous occasions to teach in Suzuki festivals, held in Santiago, the capital of Chile. This is the first time that she has traveled to a different region (state) of Chile-Antofagasta, whose principal city shares the same name and has an extensive musical tradition. Three cheers for Antofagasta! Three cheers for the Suzuki Method! The city of Arequipa, which has just been named a world heritage site by the United Nations, has preserved its fresh air, its blue skies and green countryside. Because of its beautiful temples, and big old houses built with white volcanic stone, Arequipa is called the “White City”. It is situated at the foot of the volcano “Misti”. The Suzuki Association of Peru and the teachers and Suzuki parents of Arequipa organized this lA philosophy course, which was taught by Carolina Fraser. On the 18th of October we opened the course in the Music School “Luis Duncker Lavalle” with 70 attendees from the Music School and from the National University “San Agustin”. The participants were piano, violin, cello, guitar, flute, recorder, and voice teachers and students. Also present were specialists in early childhood education. The young Suzuki violin and piano students (students of Benito Palomino, Angelica Roldan, and Elvira Villagra) were really looking forward to participating in the course. We are very satisfied with the way the Suzuki philosophy was received in our city and we thank our friend and teacher Carolina and hope that she will come back to Arequipa soon. Report from Clises Mulatti, Sao Paulo, Brazil. First Suzuki Piano Meeting in Sao Paulo, Brazil. 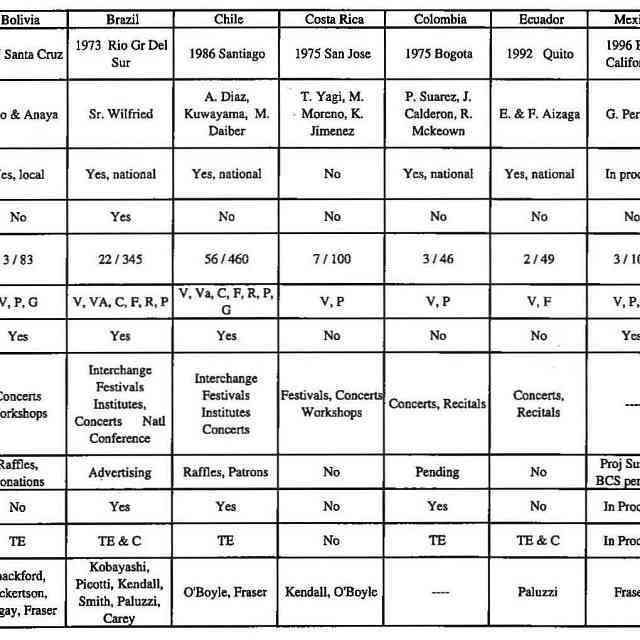 When people ask me how I organized the First Piano Suzuki meeting in Sao Paulo Brazil, I must think about how I started in the Suzuki Method; and then I find myself asking what makes this interesting? It all started in New York City some years ago. 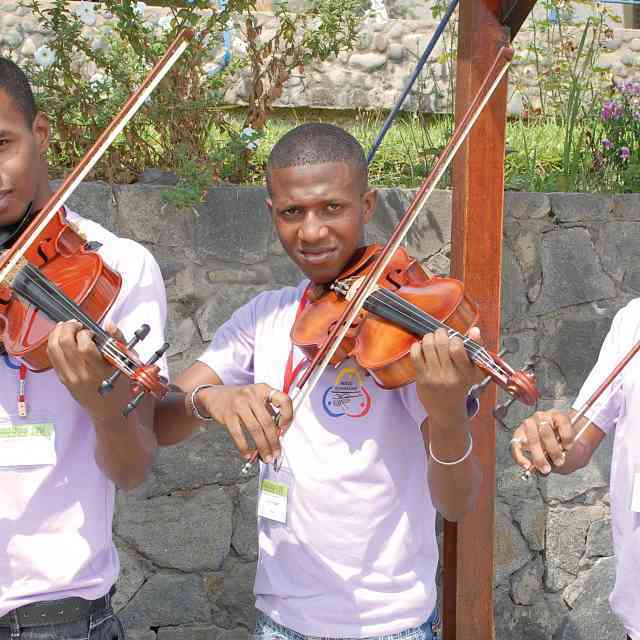 I met three Brazilian violin players, two girls and one boy, now 17, 19 and 21 years old. In all of my life I had never heard anybody playing the violin with such passion and pleasure like these three young Brazilians. They could get from music all the satisfaction and pleasure that anything could give them. They were young and had all the opportunities teenagers have every day. However, for these young violin players, life was spending their summers in music camps, or playing in magnificent auditoriums such as Carnegie Hall, and other important theatres in Europe and in the USA. Their mother, who is a good piano player from Brazil, and also a special friend of mine, used to be my piano teacher when I was a teenager. One day she showed me the school where her sons had been trained: the School for Strings, in New York City. At that time, I was in New York City taking Dalcroze training and I was searching for a different approach for my students. I was trying to find a global way to develop students in a world in which things go too fast, and the children seem to be left on their own to learn. If they just look at a piece of paper, and try to make music without listening to the sounds deep inside, without feeling it in each muscle or nerve, none of it makes sense. Everything moves and makes music or sound in this modern world: TV, video games, computers, radios, and children love them no matter whether the teachers and parents do or not. I thought that a good way to keep the students interested in making music was to have them feel more and more and make the music with their whole body and their senses. That’s it. I was looking at three students who had learned music through observing, absorbing, repeating, and more than that; they had made music with love, self-confidence and pleasure. That was my first step. The second step was the Suzuki Philosophy. This is most important for the Suzuki Method. When I thought about a Suzuki course in Sao Paulo, Brazil, it was natural for me to think about the philosophy. It was also natural to invite Caroline Fraser to give the course because of her musicality and knowledge. During the last few years I have met many such brilliant Suzuki teachers who are also wonderful musicians in Institutes in the USA, and during the festivals in Peru, Chile, and Blumenau, Brazil. I wanted to bring many of them, for each one is unique in their instrument. For readers who do not know, Sao Paulo is a state in Brazil without a tradition in Suzuki piano training. It was a big challenge to organize a course like this. I wanted to find a way to spread the Suzuki Philosophy to a large number of people from all over the country. In a big nation like Brazil this seemed as if it would be very difficult: I would say, it seemed like a dream. At that point it did not matter to me whether or not the people were familiar with the Suzuki Method. If they were musicians, music teachers, piano teachers, they received a letter with information about the course. Some months beforehand I had met Maria Ignes Scavone Teixeira, a well-known Suzuki piano teacher from Curitiba, in the South of Brazil. We decided to work on this together. The course would take place in Sao Paulo at the Tom sobre Tom, School of Music. In April we decided to send a letter asking who was interested in participating in a Suzuki course, and we also invited students. From this date until June we sent two more letters talking about the course with reminders of the dates. In this way the people could keep the invitation in their minds and probably it made everything clearer for them. We received many e-mails, and faxes with questions about the course. We answered each one. This process made everyone feel closer and I think helped give the participants the confidence they would need to come to Sao Paulo. We had 53 teachers representing 13 cities from all over Brazil, and 18 students. Most of them were piano teachers but there were also violin, viola, cello, guitar and recorder teachers present. The First Piano Suzuki Meeting was acclaimed by participants, a great opportunity to learn and enrich their teaching skills. I think that in addition, the course greatly benefited the teachers who could not afford to leave the country and attend conferences abroad. I would like to thank Suzuki teachers and students all over the world, for the new ideas that are being incorporated into music teaching. Brazil is growing little by little in the process of developing new cultural opportunities and I hope that we can continue walking this path towards great musical achievement. I got married in January 1983 when I was 24 years old and my wife was 21. Our first son, Pedro Henrique, was born in October of the very same year, and it was diagnosed that, due to a genetic accident, he had Down’s syndrome. It was very difficult to us to bear the news, as he was our first son, and we did not understand how it could have happened. We were young and healthy, and we thought that this was a heavy burden for us to carry for the rest of our lives. What would Pedro Henrique’s life be like? And ours? What were the chances of fulfilling all the plans we had made for him? How could he survive in this materialistic and discriminating world? Well. After 3 months of initial anguish we started to think more clearly and searched for alternatives for him. That was when we were told about a clinic in Rio de Janeiro, called Our Lady of Glory, where Dr. Veras had developed very important work with brain injured children. After a week of training we developed a program that consisted of a series of physical exercises and others. In the beginning, we doubted whether we would have any good results. We couldn’t even imagine how a 3 month-old child would pay attention to phrases like “daddy is tall”, “mommy is happy”, “it’s raining today” and others; colourful lights that went on and off, Spanish lessons, English and German recorded in a cassette, Mozart’s music, Vivaldi and Bach. Even mathematics and numbers. How could a child with a brain injury possibly do all of this? But it didn’t matter. The love we had for Pedro Henrique would never stop us from trying. We repeated the program innumerable times a day. Sometimes I did it, sometimes my wife, or the babysitter. Day after day, week after week, month after month, year after year. We returned to Rio one more time. The program was altered. We received a lot more material. More phrases… more songs… more Portuguese lessons… more… and more. We couldn’t stop for a single day. We always believed everything would work. We didn’t know when. But hope springs eternal. We didn’t have to wait long. Soon Pedro Henrique started to give us the first signs that all the exhaustive work had paid off. At the age of three years and six months he recognized a lot of words from cards and also colors. He could already read words that were familiar to him, such as ball, home, mommy, door, kitchen, etc…Although he spoke with difficulty, we understood what he was telling us. Today, in this Suzuki philosophy course we found out that the only thing we did was to teach him with love. Now Pedro Henrique is almost 17, and has reached 6th grade. The first five grades were completed at a private school and the 6th grade at a public school. His best grades were in English, and this amazed the teachers. He reads and writes fluently in Portuguese. He is an expert in writing love letters to his girlfriends. He watches and understands movies with subtitles… and he even talks about them with his younger brother. He fully recognizes musical styles and their composers. “Is this Beethoven, dad?”Is this the bassoon, from Peter’s grandfather?” (Referring to Prokofief’s masterpiece, “Peter and the Wolf”)… “I love the sound of the violin”, he says. He recites a lot of passages from the Bible. And he takes drum lessons (and does very well at it), playing with his feet and hands, which is something I can’t do. I am filled with joy at seeing this very close parallel between the Suzuki philosophy and my personal experience. Undoubtedly, I want to study this more and become better acquainted with this wonder of the 20th Century, the Suzuki Method. “Muchas Gracias por todo” and may God bless us all. -Translated by Grace Carvajal Mulatti, Sao Paulo, Brazil.